More than one million people are diagnosed with diabetes every year in the United States. Because diabetes can cause serious negative health consequences, it’s important to take precautionary steps in order to stay healthy and minimize your risk. If you’ve been diagnosed with pre-diabetes, or your primary care doctor believes you’re at risk for developing it, keep reading to learn how you can help prevent Type 2 diabetes. Obesity – Your body mass index (BMI) exceeds the recommended number. 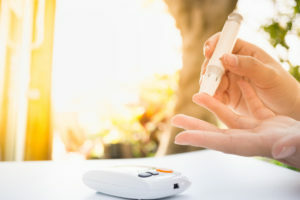 Being 45 years of age or older – The risk for Type 2 diabetes tends to increase with age, but patients of any age can be diagnosed, including children. Family history of diabetes – If Type 2 diabetes and/or pre-diabetes run in your immediate family, you may be at a higher risk. Sedentary lifestyle – You don’t spend enough time exercising and do so less than three times per week. Gestational diabetes – Pregnant women who were diagnosed with gestational diabetes have increased risk for developing Type 2 diabetes. Polycystic ovarian syndrome – Women with PCOS also have increased risk for becoming diabetic. If any of these risk factors apply to you, it’s important to take action. With help from your primary care doctor, you can learn how to correctly manage your health and eventually lower your risk for Type 2 diabetes. As your doctor gets to know you, he or she will learn what works best for you and be able to guide you in the right direction. Losing weight is one of the most effective ways to prevent Type 2 diabetes. This is because when you have too much fatty tissue, your body has trouble responding to insulin. Fortunately, there are many easy ways to eat a healthier diet and increase activity levels. For starters, try walking for 30 minutes a day, five days a week and cut back on sugary drinks and snacks. You can discuss personalized diet and fitness plans with your doctor to find one that best fits your needs. For women with PCOS, another way to prevent Type 2 diabetes is by managing your condition. At Vanguard Medical Group, you’ll find expert women’s health practitioners who can provide regular checkups and testing, as well as prescribe any necessary medication. Learning you have a high risk for developing Type 2 diabetes can be scary and overwhelming. But at Vanguard Medical Group, you can trust that your health is in good hands. By discussing your concerns with your doctor and creating a personalized prevention plan, you’ll be well on your way to better health. The primary care doctors at Vanguard Medical Group help patients manage chronic conditions, like diabetes, every day. To learn more about diabetes prevention or to schedule an appointment, contact your local Vanguard office today.